The cycle consists of four main stages: expansion, peak, recession and recovery. Each stage is defined by different price dynamics, number of transactions and construction volume. Understanding how this works is an essential skill for any potential property investor. Every property market develops cyclically but they all have individual features that set them apart. Market cycle length, depth of decline and rise can be also affected by external factors (war and terrorism, migration, international politics, etc.). Property markets, just like the economy, work on cycles that are conditioned by periodic fluctuations caused by an imbalance between supply and demand — most commonly because supply doesn’t keep pace with the rapid changes in demand. 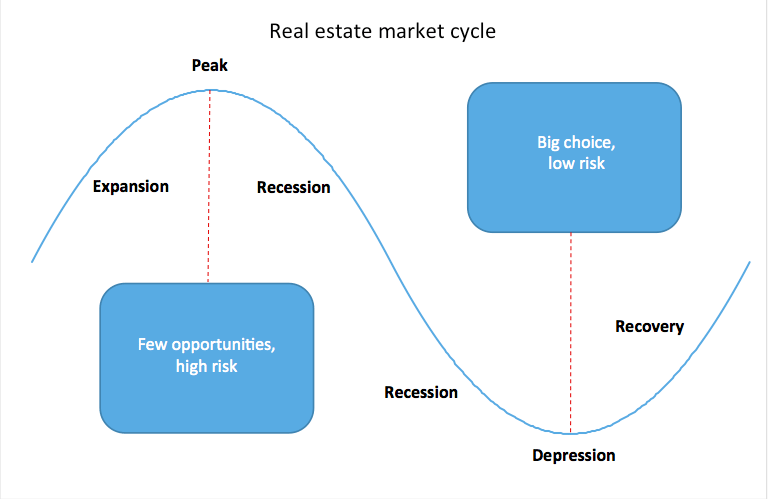 Understanding property market cycles is an essential skill for any potential property investor. Depending on the stage of the cycle, investors have more or less opportunities to buy. Expansion is the product of economic growth and increased purchasing power. The market cycle enters this phase when property for sale falls to its lowest point while buyer interest, on the contrary, continues to grow significantly. Higher demand leads to more transactions. Banks grant more mortgages and investors actively put up capital to build new property to satisfy the increased demand. As property becomes scarce, prices and the rental rates rise. At a certain point, the inflated prices stop drawing attention and become somewhat commonplace; investors expect price growth to continue covering their expenses indefinitely. On top of that, the rapid growth encourages speculation. Eventually, property prices significantly exceed the real buying capacity of individuals and businesses so the number of transactions starts to decline. At the same time, construction work that began back during the expansion period cannot cease overnight. This is when the market is at risk of a bubble. A recession manifests itself as a decrease of prices and rental rates caused by falling demand and increasing numbers of vacant property as well as newly completed construction projects being put on the market. During a recession investors freeze new projects, and the rate of construction declines. Recovery starts when prices reach a level corresponding to the needs and capacities of the buyers. The market recovers, the number of transactions grows gradually, and the excess vacant property dwindles. Demand begins to absorb the extra property created during the recession. While economic growth helps the recovery phase, as it stimulates demand for residential and commercial property, it’s not a granted parameter. To determine what stage of the cycle the market is in, investors need to observe the long-term dynamics of the main business indices on supply and demand as well as the behavior of the main market proxy (property prices). Demand can be expressed by the number of transactions or the amount of granted mortgage loans. Collateral data, such as the number of purchase and sale registrations and the volume of transactions can be integrated into demand calculations. Purchasing power is expressed by the population’s personal income to property value ratios like the income to average property unit price ratio or the proportion of mortgage repayments in the total household income. Supply can be expressed by the number of new construction projects or completions and residential property volume indices. Property value is embodied by the price per square meter or rental rates. At the turn of the millennium, the property market cycle in the UK began expanding and ended in the 2007 property crash. During the expansion period from 2001 to 2007, prices increased by 77.25 percent, more than the previous cycle in the 1980s when they gained 63.6 percent. The price surge of the 2000s was associated with an increase in demand: between 2002 and 2008 the total value of mortgages granted grew by 64 percent, from £221 billion to £363. It was followed by an increase in the rate of construction: between 2000 and 2007 the annual number of completed projects grew by 30 percent. A bubble had formed on the property market. The rate of price growth began to exceed the buying capacity of the British, and by 2007, the proportion of household income spent on mortgage repayments reached 51.8 percent in comparison to 26.5 percent in 2000. For the first time in 18 years, the ratio of property prices to household income hit 5.75, compared to 4.83 at the peak of the previous cycle. Recession set in by the middle of 2007 and demand fell sharply: the number of transactions shrank almost by half, from 1.6 million in 2007 to 850,000 in 2008. At the same time, the number of mortgages granted dropped by 28 percent. In just a year and a half, the average property value in the UK dropped by 17 percent. From the second half of 2007, the number of new construction projects began to decline, and by mid 2008, it reached a 20-year low of 16,000, against 50,000 in the middle of 2007 . By 2009 the number of residential property transactions dwindled to 800,000, and the average property price fell to 162,000 — a level previously witnessed in 2005. The recession continued from 2009 to 2012 before recovery started in by early 2013. Demand was restored over time, and by late 2014, the number of transactions reached 1.2 million, only 400,000 less than during the 2007 peak. Property prices began to grow again and gained 20 percent between Q1 2013 and Q3 2015. At the same time, construction started back up: in Q1 2015 the number of new construction projects reached 40,000, only 10,000 less then during the peak of 2007. At the first signs of price growth there were concerns that a new bubble would form. But during recovery, prices can only rise until they collide with the demand. Currently, the proportion of mortgage payments to household income is 28.8 percent or half of what is was in 2008 when the ratio of property prices to household income was 5.1. The right time to buy property is at the beginning of the recovery phase when the prices are lowest and have nowhere to go but up. On the other hand, the best time to sell is when expansion is tapering off or the market is about to peak. Every property market develops cyclically but they all have individual features that set them apart. For example, Germany’s market transitions smoothly from one stage to another thanks to the legislative control. However, Spain’s market has more freedom so sharp declines and upturns occur frequently. Property markets inside the country also vary. For instance, the situation on the London property market is different than the UK’s other cities. In Spain property prices are increasing in the north but declining in the south. Real estate in the world’s leading cities (New York, London and Hong Kong) act as their own market and should be analyzed as such. When choosing property, buyers need to study the market conditions and consider the long-term outlook to define how long the property will remain liquid and if its price will grow over time. When choosing property, buyers must study market conditions and look at the long-term. Ivan Chepizhko is an expert in real estate economics and journalist at Tranio. You can follow Ivan’s news on LinkedIn.